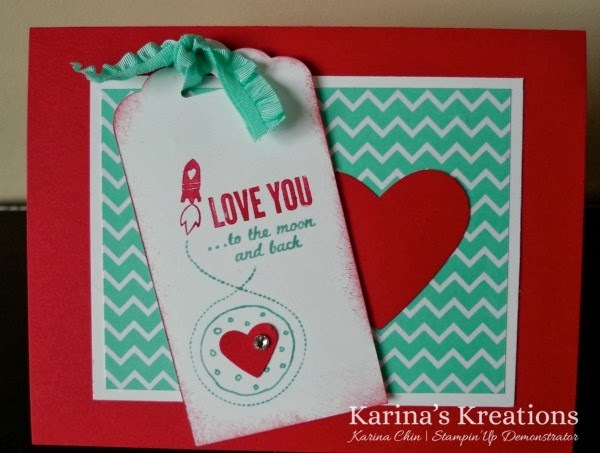 Karina's Kreations: Stampin'Up Love you to the Moon Card! Stampin'Up Love you to the Moon Card! I'm at a Creative Day Retreat today and this is my swap card. I used the Super Cute stamp set called Love Me to the Moon. This set works great with Stampin' Write markers becuase you can color directly on the rubber and stamp with it. I used Costal Cabana & Real Red Stampin' Write markers on my card. The designer paper is Fresh Prints Designer Paper Stack It's 4-1/4" x 6-1/2" and is perfect for card making. There are 12 double sided designs with 48 sheets in total! I added some Costal Cabana Ruffle Trim ribbon and two hearts punched out with the small Heart and full heart punches. Buy all the supplies for this card and earn a free Sale-a-bration item. Click here to shop now!